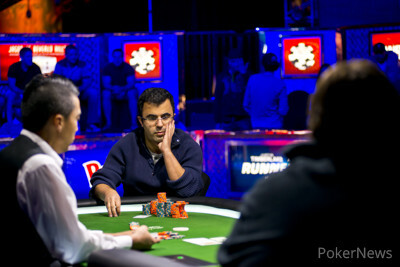 Hand #146: Majid Yahyaei raised from the button and Jason Duval folded. Hand #147: Duval made it 165,000 and Yahyaei called. The flop came and Yahyaei checked. Duval put 185,000 into the middle and Yahyaei called. The turned and both players checked. The hit the river and Yahyaei tapped the table. Duval tossed out 380,000. Yahyaei let his hand go and Duval dragged in the pot. Hand #148: Yahyaei opened to 200,000 and took it down preflop. Hand #149: Duval opened with a raise to 160,00 and Yahyaei called. The flop came . Yahyaei checked, Duval bet 185,000 and Yahyaei called. The hit the turn and Yahyaei checked a second time. Duval moved 370,000 forward. Yahyaei folded and Duval took down the pot. Hand #150: Yahyaei made it 200,000 from his button and Duval came over the top for 555,000. Yahyaei tossed out a call. The flop brought and Duval continued for 435,000 and Yahyaei wasted no time at all making a call. The turn was the and Duval moved all in. Yahyaei let it go and Duval scooped a massive pot. Hand #140: Jason Duval got a walk. Hand #141: Duval raised the button, and Majid Yahyaei folded. Hand #142: Duval got another walk. Hand #143: Duval made it 165,000, and Yahyaei called. He then check-called the flop. The turn brought a , and Yahyaei grabbed the lead with a bet, to which Duval folded immediately. Hand #144: Yahyaei raised to 200,000, and Duval folded. 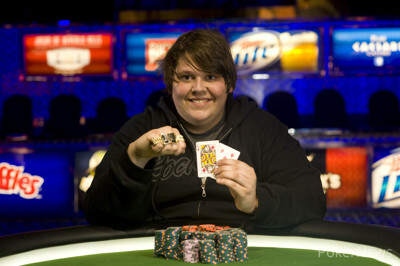 Hand #145: Duval made it 165,000, but Yahyaei wanted higher stakes: 565,000. Duval mucked. Hand #137: Jason Duval received a walk in the big blind. Hand #138: Duval raised from his button and took down the pot. Hand #139: Yahyaei raised to 200,000 and Duval called to see a flop. The dealer fanned . Duval checked to the raiser and Yahyaei continued for 250,000. Duval flat called to see a turn. Fourth street brought the and Duval checked for a second time. Yahyaei moved out 400,000. Duval came out with a check raised to 845,000 and Yahyaei called. The river was the . Duval moved 1.3 million into the middle. Yahyaei called and Duval showed for the nuts, dragging in a massive pot. Hand #131: Majid Yahyaei raised preflop, and Jason Duval folded. Hand #132: Duval's turn for a raise-and-take. Hand #133: Yahyaei raised to 200,000, and Duval called. Both players checked the flop, and a turned. Duval bet 210,000, and Yahyaei called. The river was a , and Duval bet 465,000. Yahyaei folded. Hand #134: Duval raised to 165,000, and Yahyaei made the call. The flopped, and Yahyaei check-called 180,000. A peeled on the turn, inviting another check from Yahyaei. Duval doubled the bet to 360,000. Yahyaei called again, and the river was . Both players checked. Yahyaei's took the pot with top pair. Hand #135: Yahyaei raised to 200,000 and took the pot. Hand #136: Duval raised to 165,000, and Yahyaei came back with a three-bet. Duval folded. Hand #126: Jason Duval raised to 190,000 from his button. Yahyaei made it 600,000 to go and Duval folded his hand. Hand #127: Yahyaei made it 200,000 from the button. Duval called and the flop brought down . Duval checked and Yahyaei checked it back. The turned and Duval checked again. Yahyaei made it 275,000 and Duval called. The rivered and put four to a heart flush and a straight on the board. Duval fired 470,000 and Yahyaei went into the tank for over a minute before flat calling, showing the for a queen-high flush. It was the best hand and he dragged in the pot. Hand #128: Duval raised to 160,000 from his button and Yahyaei folded. Hand #129: Yahyaei folded his button. Hand #130: Duval raised to 160,000 and Yahyaei called. The flop brought and Yahyaei checked. Duval continued and Yahyaei mucked his hand. Hand #122: Jason Duval raised, and Majid Yahyaei called. The flop came , and Yaehyaei check-called 155,000. A turned, and Yahyaei checked again. He folded to Duval's turn bet. Hand #123: Yahyaei raised to 140,000. Duval repopped to 410,000. Yahyaei gave up the pot. Hand #124: Duval raised to 155,000. Yahyaei took his turn to repop, this time to 425,000. Duval called. The players took in a flop of . Yahyaei continuation-bet to 550,000. Duval called the hefty bet, and the turn came . Yahyaei checked after tanking for a minute, and Duval checked behind. The river was completing even more draws. Yahyaei bet 1.2 million, and Duval folded immediately. Purple T100,000 chips have been introduced. Hand #125: Yahyaei made it 140,000, and Duval called. Duval checked the , and Yahyaei fired 175,000. Duval came out with a raise to 480,000. Yahyaei called. A arrived on the turn, Duval fired 655,000 this time, and Yahyaei folded. Hand #116: Jason Duval raised to 130,000 from his button and Majid Yahyaei called the raise. The flop came . Yahyaei checked and Duval continued for 155,000. Yahyaei flat called to see the fall on the turn. Yahyaei rapped the table once more and Duval checked it back. The river was the and Yahyaei cut out 400,000. Duval let it go and Yahyaei dragged in the pot. Hand #117: Yahyaei made it 140,000 from his button and Duval slid out a three-bet to 410,000. That was enough to win it as Yahyaei threw his hand to the muck. Hand #118: Duval popped it up to 130,000 from the button and Yahyaei announced a call. The dealer fanned on the felt and Yahyaei checked. Duval continued for 155,000 and took down the pot. Hand #119: Yahyaei made it 140,000 from his button and Duval folded his big blind. Hand #120: Duval made it 130,000 from his button and took it down preflop. Hand #121: Yahyaei had the button and raised to 140,000. Duval called to see a flop. The dealer produced and Duval checked to the raiser. Yahyaei continued for 160,000 and Duval called. The fell on the turn and Duval checked for a second time. Yahyaei checked it back and the fell on the river. Duval showed and took down the pot with a pair of tens. Hand #111: Majid Yahyaei raised to 140,000, and Jason Duval called. The flop came . Duval check, and Yahyaei bet 170,000. Duval made the call, and the turn came . Both players checked to see an fall on the river. Both players again checked, and Duval's took down the pot. Hand #112: Yahyaei got a walk. Hand #113: Yahyaei made it 140,000, and Duval folded. Hand #114: Duval raised to 130,000, and Yahyaei called. The flop came , and Yahyaei check-folded when Duval motioned to bet. Hand #115: Yahyaei raised to 140,000, and he took the pot. Hand #107: Majid Yahyaei raised from the button and took it down. Hand #108: Jason Duval raised to 130,000 from the button and Yahyaei called. The flop came and Yahyaei checked. Duval bet 155,000 and Yahyaei called. The turn was the and both players checked to see the on the river. Both players checked again and the hole cards are unknown but the two chopped the pot. Hand #109: Yahyaei raised to 140,000 from his button and Duval called. The flop brought and Duval checked. Yahyaei continued out for 180,000 and Duval called to see the turn. Fourth street was the and Yahyaei fired 375,000. Duval came out with a raise to 950,000. Yahyaei folded and Duval took down the pot. Hand #110: Duval had the button and raised to 130,000. Yahyaei called the raise and the flop came down . Both players checked to see the turn. Yahyaei shot out 150,000 and Duval called. A fourth diamond hit the board on the river in the form of the . Both players checked and Yahyaei won the pot with for two pair.